Jason's " Rogue " casting thread. Ok, it's St David's day, so being welsh I'll open this thread. Don't be shy..... Let's have a look at those castings. Re: Jason's " Rogue " casting thread. To start the ball rolling I'll use the same example that was in Jo's Triple thread. 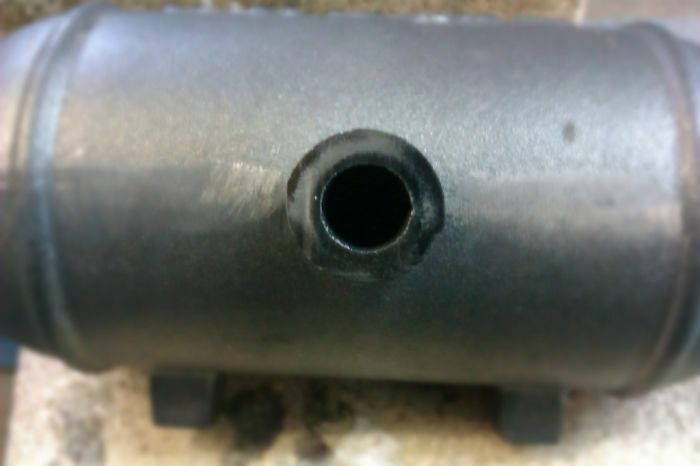 This bronze / gun metal casting looked qiute innocent from the outside, so into teh lathe it went to have the main flat surface machines and a couple of small holes started to appear, nothing critical. 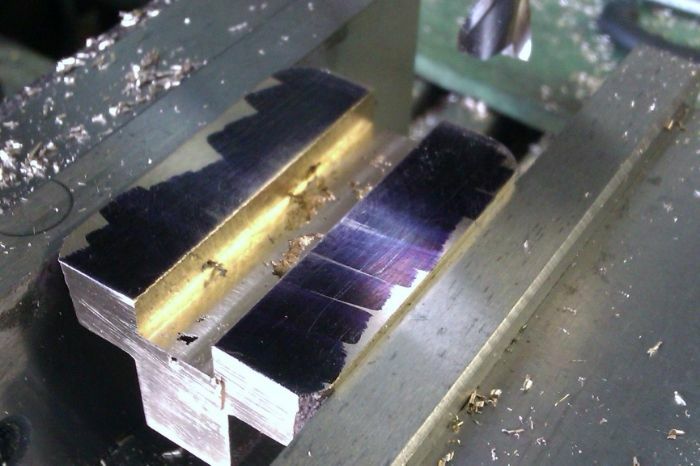 I then had to mill a slot on the opposite side which revealed more holes than a bit of swiss cheese. An reasonable looking aluminium piston casting, even had a generous chucking spigot on the end. 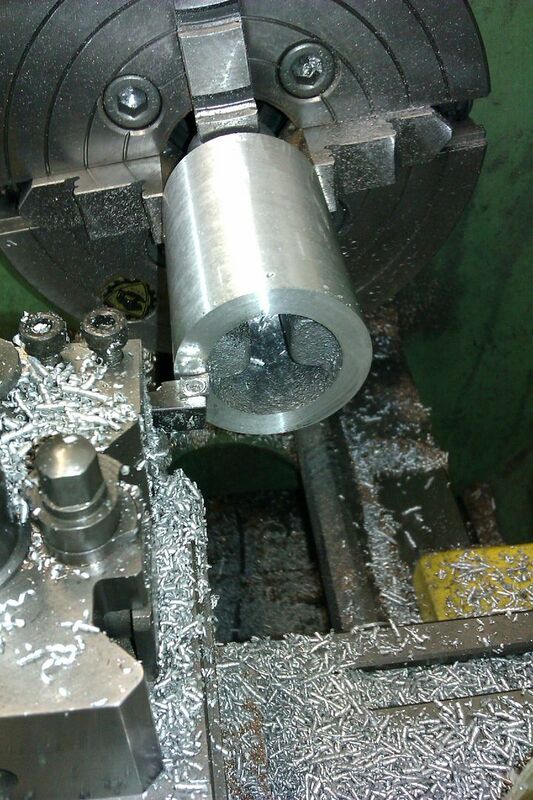 Did not seem too bad as I started to machine the other end. Sorry Jason, I was about to knock off too !! You're quite right that's not sand inclusion but looking at the very rough/ragged cavities I would say that insufficient " Head " on the sprue caused internal shrinkage, or a " cold shut/lock " during the pour. This causes the casting, as it's cooling to feed itself rather than be fed from the runner. 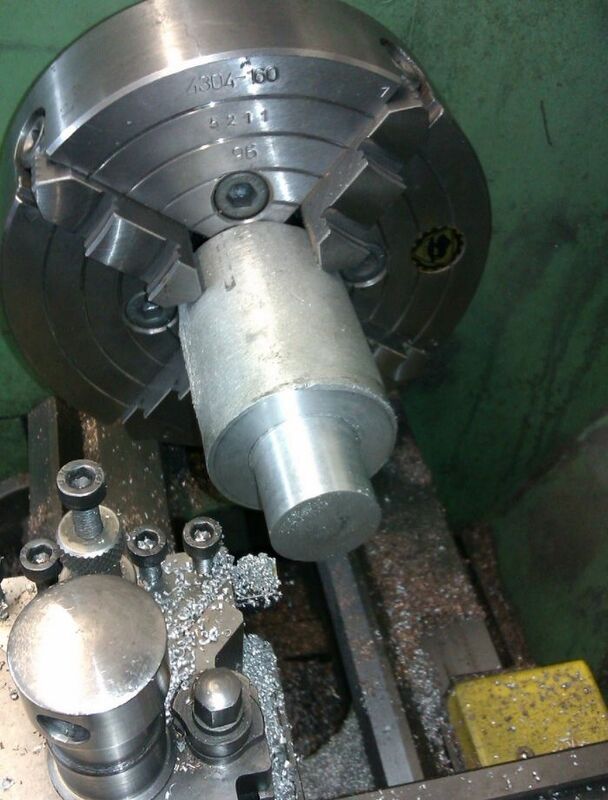 A simple remedy is to place a " Nob " ( cone shaped ) feeder near to the casting. This, because it's in the sand mould has a nice hot reservoir of metal to feed after the pour. 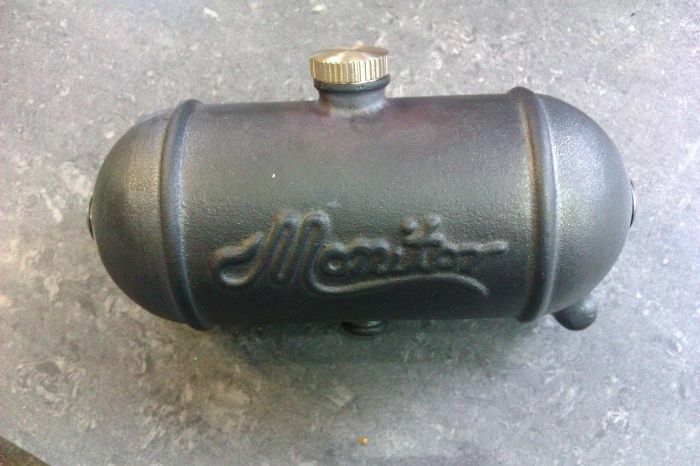 This is different to gas pockets, they are usually spherical and smooth to look at. 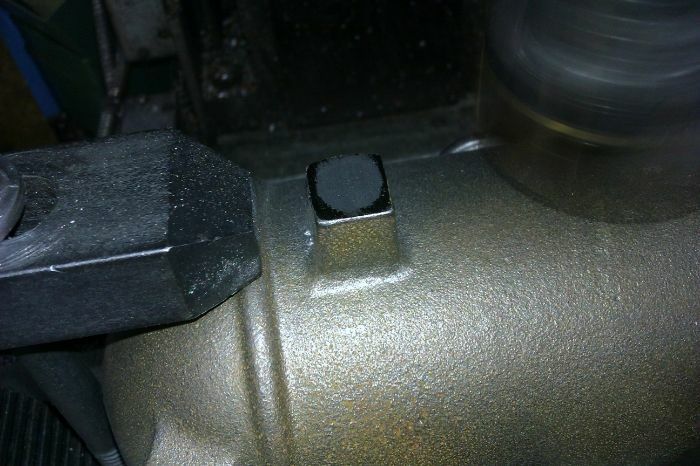 I see our posts crossed, that's my explanation for your Gunmetal castings. Good morning Jason and all. Your piston casting is one of the worst I've ever seen, there has been no degassing of the molten metal before pouring. Molten Aluminium loves Hydrogen it will absorb it from anywhere, it's mostly environmental, humidity damp tools etc. Leaving the pot to stew will take on lots. 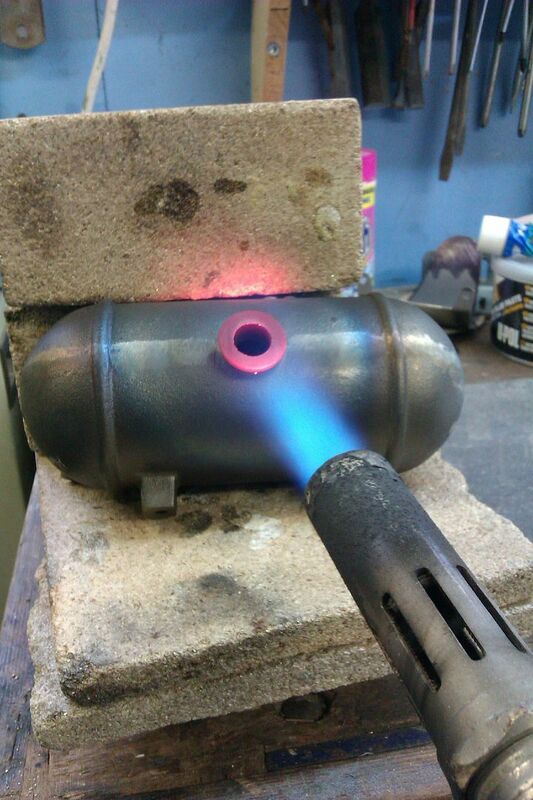 Without degassing the Hydrogen starts to bubble out as the metal solidifies, your photo speaks volumes!! A simple tablet containing Chlorine or Fluorine salts, " rabbled " through the melt will remove most and is best performed outdoors, the smell is both nasty and toxic. An " old hand " suggested mothballs but we used a proprietary brand of covering flux and degasser from a well known UK supplier. A " backyard " foundry CAN produce a viable product if they use the right materials for the job. Thank you for the excellent explanation, Graham! What about bronze/brass? Is there a similar cause/effect? In my dim distance past did they not use willow wands to stir the melt , not sure if that was brass though. With Cuprous alloys the higher temperatures usually drive off any gasses but you still need to use a " covering " flux to reduce oxidisation and loss. Brass in particular, the Zinc burns brightly and will vanish without it. The amateur can use Borax but, as usual there's always a proprietary flux/refiner/degasser available. Thanks for the insight Graham, although at this stage there is not much we can do about some of these faults its good to know what causes them and how a good foundry will deal with them. Did you see my message? These little surprises usually hid just under the surface of iron castings and tend to hide in corners or extremities. 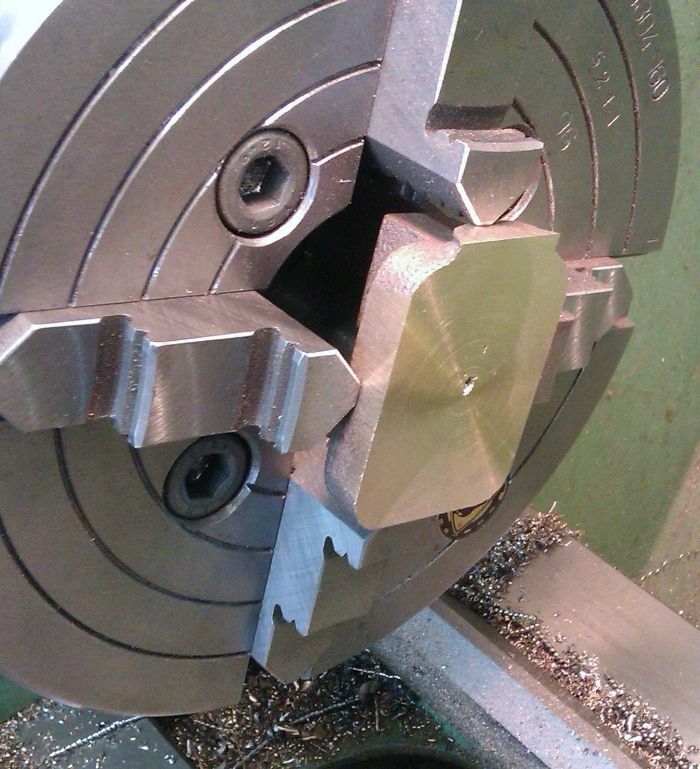 You usually don't know they are there until your HSS cutter suddenly goes blunt so always worth rubbing an old file over these hoding places or going straight in with carbide tooling. Once you gave found the chilled matal it will show up as a shiny surface compared to the usual matt iron such as these. 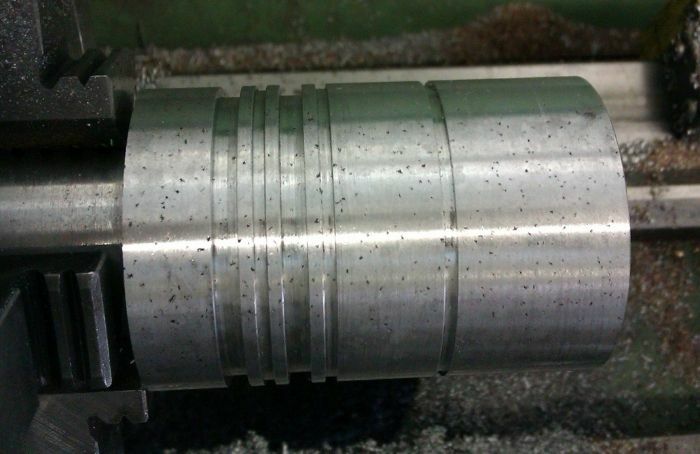 With luck the casting will have enough machining allowance for the hard material to be removed but sometimes particularly if a hole needs to be drilled or tapped near the chill then you can get into problems as the HSS drill bit or tap won't cut it, this fuel tank filler is a good example, machined flat OK with carbide but the dark areas are still all hard. Heat and a slow cool will often do the trick. 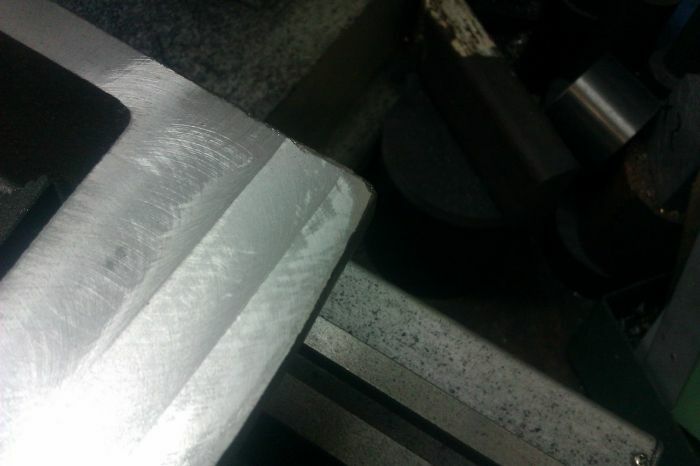 The annealed metal can then be worked. Yes common salt can be used Sodium Chloride, the Chlorine. Willow was used to " Rabble " Brass in the early days. There were many recipes going round when the Midlands got into mass producing clock parts. Akin to alchemy!! Ah, the foundry horse...... A vital part according to Roger the patternmaker. The manure made the best cores in his opinion. Then the urine also used diluted for non ferrous castings. He didn't miss the smell though! This thread is bringing back some very fond memories, thank you all. Your photo shows two problems IMO, both covered. Little to no degassing and a poor running feed to the casting causing tears. Had that been one of my kits you would have been given a replacement FOC. Yes I got your message the answer is " fractional " . The number 6 that weighs half a Ton only developed 1/2 HP! Chilled Iron castings are a nightmare your remedy is the only one IMO. That Monitor casting looks really nice BTW. The pattern plays a key role in any casting. Roger told me you need to make them 110% otherwise the casting will never look nice. I will write about finish and sand later. Bad Behavior has blocked 16277 access attempts in the last 7 days.